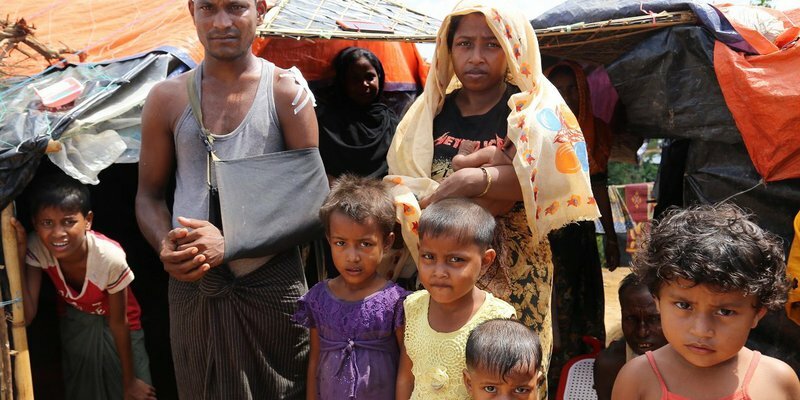 Naimullah was shot as he and his family made their way from Myanmar to Bangladesh. It was one of many acts of violence he, his wife Johora and their five children encountered on their 10-day journey. He says he saw bodies and burning homes; two people in their group died before they reached the river marking the border. Naimullah is one of the 609,000 people who have crossed the border since 25 August because of violence, joining 210,000 others who were already sheltering in Bangladesh. Hundreds more arrive every day, most of them on foot with only what they can carry. They are almost entirely dependent on humanitarian assistance to survive. Red Cross has already reached more than 327,000 people with life-saving emergency shelter, food, healthcare, water, hygiene and sanitation support, as well as addressing critical protection and psychosocial needs. After weeks without treatment while he and his family set up a makeshift shelter in Hakimpara Camp, Naimullah visited a Red Cross mobile clinic. Having a clinic in the camp means that Naimullah doesn’t have to leave his family alone and can access follow-up care. Red Cross mobile medical teams have already treated almost 12,000 people on the Bangladesh side of the border; while a fully-equipped Red Cross field hospital opened in mid-October has already provided treatment to more than 3,500 patients. In order to dramatically scale up response efforts, Red Cross urgently needs more than NZ$49 million in order to provide a range of support to a further 200,000 people. Visit our Facebook album for more photos and stories.